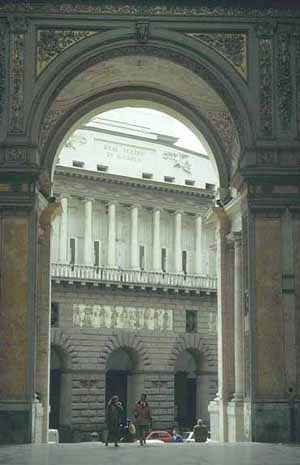 Like much of Europe during the age of Napoleon, the San Carlo theater (photo, right) entered upon some difficult times between 1800 and 1815. First of all, the revolution that set up the short-lived and French-inspired Neapolitan Republic of 1799 had actually damaged the theater, and it took a while for it to become a fit venue for opera once again. In broader cultural terms, we can look back today and see that Romanticism was about to spill across the Continent; that would change all art, including music. In shorthand, we might say that music in Naples was biding its time—waiting for Rossini. Gaetano Andreozzi (1775-1826). He was nicknamed Jomellino, ("Little Jomelli)" probably because he was a relative and former student of that composer. Andreozzi's opera, Armida e Rinaldo, was performed in the 1801 season. He was regarded as a competent composer; he wrote about 50 operas, many of which toured even outside of Italy. He taught at the Pietà dei Turchini conservatory and was also the impresario of San Carlo for a while—the person who actually booked and set the performances; he held that post when the French took over Naples in 1806 and changed the administration of San Carlo. Andreozzi eventually left Naples for Paris, where he spent the rest of his life. Simone Mayr (1763-1845). He was born in Germany, but moved to Bergamo in northern Italy in 1802. Bergamo was the birthplace of Donizetti, who became one of Mayr's music students. Mayr was also responsible for introducing and promoting the new music of his countryman, Ludwig van Beethoven, into that part of Italy. Mayr composed about 70 operas and was a staple in the San Carlo repertoire for many years. In hindsight, his music was rooted in the past, the 18th-century opera seria; nevertheless, during his lifetime, his music was popular. One of his works, Medea in Corinto was premiered in 1813 and was performed every year thereafter until 1827. Giuseppe Nicolini (1762-1842). He was from Piacenza (near Milan), but studied music in Naples at the Sant'Onofrio conservatory and was also a student of Cimarosa's. He composed almost 50 operas and significant sacred music. He and others of his generation were in the unfortunate position of having learned their craft and then having to compose music in a world that was about to change drastically. Nicolini's music was often on the stage at San Carlo until about 1815, but it was music from the Classical past and not the Romantic present. He and others were about to be overwhelmed by Rossini. Carlo Soliva (1791-1853). He was from Casal Monferrato in the Piedmont area of Italy, studied in Milan, conducted the orchestra of La Scala, taught at the Warsaw conservatory, and became conductor of the St. Petersburg opera. 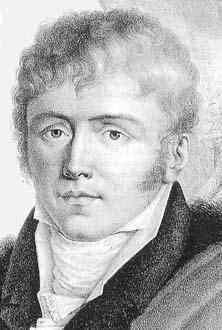 His opera, Testa di Bronzo, was on the 1816 San Carlo program and enjoyed greater success even than Rossini's Otello and Mayr's Partenope (written specifically to reopen San Carlo after a disastrous fire earlier in the year). That opera, however, remains his one "flash in the pan." 1794—a version by Alexander Reinagle (1756-1809). The composer was an Englishman who had moved to the United States. 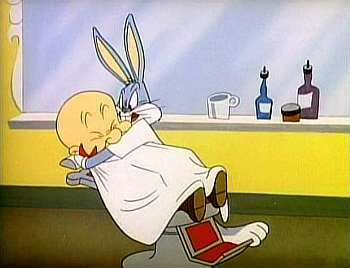 His Spanish Barber [the original English title] premiered in Philadelphia. The composer was one of George Washington's favorites! 1816—THE version by Rossini (libretto: Cesare Sterbini). 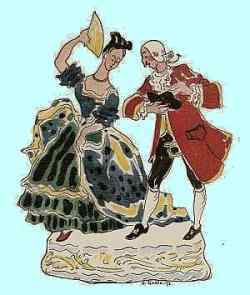 In order to avoid obvious offense to Paisiello fans, Rossini used Beaumarchais' original subtitle of the comedy, Almaviva, or the Useless Precaution, as the title of his opera; he changed the title to The Barber of Seville only after Paisiello's death. The ploy didn't work. Pro-Paisiello hecklers disrupted the first performance of Rossini's version, anyway. Here is an audio excerpt from the signature aria of Rossini's version. 1879—A version by Achille Graffigna (1816-96) (premiered in Padua); it was also a tribute, with the composer inscribing the score: "An informed study in the spirit and character of—and colored by—Rossini's immortal work." 1925—Le Mariage de Rosina, by Flemish composer Robert Herberigs (1886-1974) (premiered in Ghent, Belgium); (Rosina is Doctor Bartolo's ward in the original comedy). The composer also wrote his own libretto. 1991—The Ghosts of Versailles, an opera by John Corigliano based on La Mère coupable. 2007—Crazy Day, or The Marriage of Figaro, a musical comedy staged by Russian television. It aired for the first time on New Year's eve of 2007. Features Sofia Rotaru in the role of Marceline.